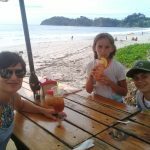 My family and I were lucky enough to go to Costa Rica over the summer. It was an amazing place: full of friendly people, interesting adventures, beautiful plants, unique animals and tasty food. 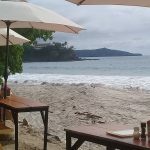 One of our most memorable meals was in Playa Flamingo at a beach restaurant called Coco Loco, which we found on our Fodor’s Guide (yes, I still enjoy travel books). (Trip Advisor Reviews). We had the place and the beach to ourselves (probably because a storm was heading our way). There was something for everyone. My son had their signature dish of seafood mixed with rice and vegetables and cooked in a whole coconut. My daughter had a wonderful salad, which included palm nuts (new to us). And my husband and I enjoyed the freshest fish tacos ever. But it was our side dishes of coconut rice that had us discussing how we would replicate as soon as we got home. It was very simple but so flavorful and delicious. My son initiated finding a recipe and making it once we got home. 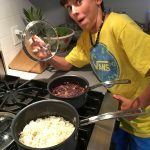 The Costa Rican version had a mixture of brown and jasmine rice, which we haven’t perfected. But this is what we’ve been making from Vegetarian Times and substituting Earth Balance “butter” to make vegan so my daughter could enjoy too. Amazing how it brings our thoughts back to that amazing beach…. 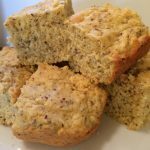 Vegan Cornbread – Yes You Can! I’m on the constant hunt to find “regular” recipes and make them into vegan versions so my daughter will eat them. Since I was making my vegetarian chili for dinner I decided to test out a vegan cornbread. I adapted this from a Food Network recipe and it was surprisingly good. It makes use of a “flax egg” rather than a real one. I used my daughter’s Ripple (pea protein milk) for the soy milk in the original recipe. Next time I may even add some fresh corn. My whole family ate it happily with the chili. Preheat oven to 425°F. Spray 8-inch-square baking dish with nonstick cooking spray. Bring water to a boil in a small saucepan. Add the ground flax meal, reduce the heat to medium-low, and simmer the ground flax seed in the water until thickened, stirring occasionally. Takes about 2 – 3 minutes. Set aside. In a medium bowl, whisk together flour, cornmeal, sugar, baking powder, and salt until well-combined. Add the ground flax seed mixture, milk, and canola oil to the flour mixture. Turn into prepared baking pan. Bake for 18 to 22 minutes, or until a toothpick inserted in the middle comes out clean. Cool on wire rack 10 minutes before cutting. Hands down these are the muffins I get the most requests to make, and garner the most compliments. I can’t believe I never shared here. Sorry. Whether it’s a school function or a team snack. They work for all ages and diets. I hate to say upfront that they’re vegan because then some may not want to try them. But they are. I can’t even tell you where I got the recipe. I found it online, printed it, and pasted it in my recipe notebook when my sister was just starting a vegan lifestyle. I made them for Easter brunch about 7 years ago and have been making them ever since. They check a lot of boxes for diets, but no they’re not gluten free. If you have a lemon tree, you can make these at a moments notice. Preheat the oven to 375F. Lightly grease a muffin tin. 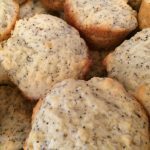 In a large mixing bowl, mix together flour, sugar, baking power, poppy seeds, and salt. 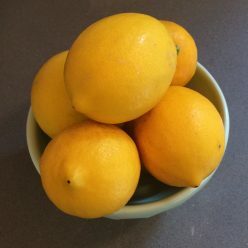 Make a well in the center and add milk, lemon juice, zest and vanilla. Mix just until moistened. Fill muffin cups 3/4 full and bake for 15 – 20 minutes or until muffins are lightly browned on top and a toothpick inserted in center comes out clean. Transfer to cooling racks. 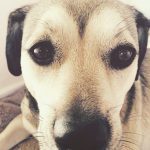 This is a guest post by Jenny Holt, freelance writer. The timing was perfect as we’re celebrating our dog’s 2nd year of adoption this weekend. My kids are making the Peanut Butter Delights. We want nothing but the best for our furry best friends. There are plenty of options for a special treat for your dog off the shelf. However, there is nothing more special than making something from the scratch, right in your own kitchen. Reward your dog’s good behavior by baking him a home cooked treat, with a secret ingredient. These homemade dog treats are quick and easy to prepare. So, what are you waiting for? Let’s prepare a surprise for your dog. will love to gorge on them. Here is how you can quickly make a peanut butter delight for your pet. Set your oven to 350 degrees before you start preparing. Take a large bowl and use your fingers to mix all the ingredients together. Make sure that all the lumps are removed and you have a smooth dough. Once smooth, you can roll it into a ball using your hands. Place it on a silicone mat. It is important for the dough to be at least ¼ inch thick. You can also place it in refrigerator for an hour before you use a cookie cutter to cut out the treats. On an ungreased baking sheet, place the mini bones (cut using a cookie cutter) and bake for 18 minutes until golden brown. Dogs love their rawhide chews. While it can keep them busy for hours, they can be really bad for your pet’s digestive system and gums. If these rawhides are digested without being chewed properly, they can make it very difficult for your dog to pass stools and they may be in some discomfort. Instead of feeding them chemical rawhides, prepare these easy to make sweet potato chews. You can not only control what your pet is eating, they are also easy on their digestive system. Set your oven to 250 degrees and preheat before you start preparing. Start by cutting the potato into slices that are at least 1/3-inch thick. You can also slice it lengthwise for bigger pieces if you have a larger dog. Use a baking sheet and line it with parchment paper for easy cleaning. Lay slices on the sheet. Make sure that they are flat and do not overlap. Bake the slices for 3 hours. When then have been in there for nearly an hour and a half, you can turn the slices over to bake the other side. Hang the chews on a wire rack and let them cool completely before serving them. You can store the excess chews for up to 3-months in a freezer. Don’t worry if the chews appear soft as you take it out of the oven. They will eventually harden and become chewable as they cool. You can make them more tasty by slathering peanut butter on top to tempt your pet to try. 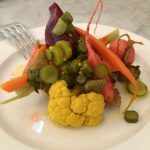 Prix Fix Vegetarian – so a nice prix fix is fun and sometimes fancy. This used to be for special occasions with my husband and I. However now my kids appreciate these dinners as well. Our favorites this year were vegetarian and vegan meals from The Whale Wins and Harvest Beat in Seattle. Also musician, Moby’s, L.A vegan restaurant, Little Pine. 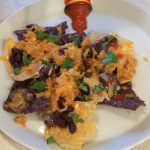 Cholula – my son has always liked hot sauce and hot peppers, but since discovering Cholula it’s on the table at every meal from eggs in the morning to nachos and burritos at night. My husband got into the act too. Yes, the hottest trend at our house. 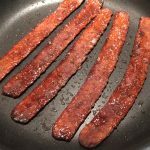 Tempeh Bacon and other vegan mysteries – this year marked the switch of my daughter from eating a vegetarian diet to going vegan. We’re discovering more and more plant based foods and meat alternatives all the time. My daughter loves when her aunt and uncle make fake bacon, however I never got the hang of it until recently. This time I watched my sister and brother in law. Basically you cook it in a pan in a bit of oil for much longer than the package instructions. Then it gets crisp. 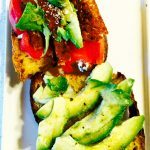 Avocado Toast – my daughter has always enjoyed avocado on everything. However once I started working at Juice Girl, not only do I make avocado squares for others I make them at home too. The bread is key. I am also amazed at all the creative and beautiful looking toasts on Instagram. Great inspiration. Kale – like everyone else we are on the kale bandwagon. Whether it’s sautéing in garlic and olive oil, chopping fine for a salad or adding to soups and smoothies. Kale is here to stay in our fridge. 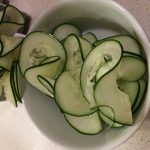 Spiraling – I didn’t think I needed another appliance but we’re having such fun with this. Kids are eating lots more veggies and they love making the noodles. They even shape the left-overs into interesting sculptures. Our favorite is veggie noodles sautéed in garlic and tossed with spaghetti noodles. 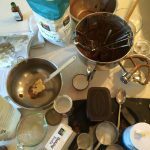 Messes – I am very excited to have my kids cooking so much. Also fun to see our Cook This Book! published and being used by friends and family. However in 2017, we’re going to work more on the clean up. Teaching to clean up as they cook has been a challenge as dishes and ingredients pile up everywhere. My kids have been crazy lately for smoothies. It may be that I’m helping at the local juice, smoothie cafe in Mill Valley, Juice Girl. Or it may be that it’s still sunny out. Or it may be that it’s easy and creative and each one turns out to be a surprise, if just following your imagination and what’s in the fridge. Even at Juice Girl I’ve learned there’s lots of variations in the same smoothie. There’s even a bit of adjustments to get the right consistency throughout the day. The frozen fruit in the morning is more frozen and hard than in the afternoon (after doors have been opened and closed all day). Not likely an issue at your house. Also the sizes of fruits certainly vary. A large banana will make your smoothie thicker than a small banana. There’s the color as well. Not every homemade creation is a lovely color. My kids have made a few that look quite poo-like. Not suitable for a smoothie shop, but still tasty (and funny) at home. 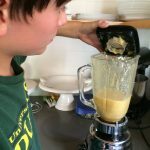 My son likes to put in everything in a smoothie – yogurt, juice, fruit, even spices such as ginger. My daughter is more of a fruit purist and coconut milk. Although they’re both becoming open to more greens and nut butters (can’t all be sugar) in there too. Thanks JG! Using the blender is a good appliance that’s relatively kids safe as well. Note, I didn’t saw mess proof. Be sure those lids are on tight. 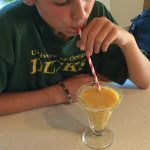 If your kids are inspired here are a few to get started from my new book, Cook This Book!, and then let them have the blender to create whatever they’ll drink. That’s kind of the rule at my house. Don’t create something just to experiment, and then not eat it. Just keep adding until it’s edible. And speaking of waste…UKonserve has some crazy statistics about plastic straws. Check out their stainless steel ones to cut down on plastic when making at home. (They have a special thru the end of September). I also have paper straws. But these can prove difficult depending on the smoothie texture. 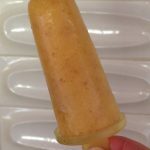 Remember to freeze any smoothie left-overs in popsicle molds to enjoy frozen. Here’s two from page 96 of Cook This Book! The taste of the tropics in a cold and frozen treat. Everyone likes the combination of peanut butter and banana. Here’s a simple shake recipe; you can substitute any milk or milk alternative, as well as nut butter for peanut. 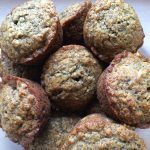 Having frozen ripe bananas in the freezer make this fast and convenient for a breakfast or afterschool snack. Put all ingredients together in a blender. Blend until smooth, and honey and peanut butter are incorporated, about 1 minute. Preheat oven to 375F. With a fork, combine flour, flax, soda and salt in a small mixing bowl. Melt butter in a small saucepan over low heat. Or melt butter in microwave for 25 seconds on high. In a large bowl combine melted butter, applesauce, mashed banana, sugar and eggs. Mix together with a rubber spatula. Add flour mixture to applesauce mixture and stir until just blended. Batter will be lumpy and very moist. Spoon batter into greased mini muffin tin cups 2/3 full and place banana slice on top of each muffin. Bake for 15-18 minutes or until golden brown and set*. Remove pan from oven and cool on a rack 5 minutes, before turning out muffins. *Note. Because these muffins are so moist with the mashed bananas and applesauce, the wooden pick test is difficult. The center may not come out clean if you hit a chunk of banana. If you’re not sure if they’re done, you can always pop one out and cut in half. Tomorrow will be exciting but it will also be tough. Tough to wake up and get it all done in time for school. Luckily here are some quick and allergy friendly ideas from PositiveHealthWellness to get you and your kids excited to make lunch tomorrow and all the school days ahead. 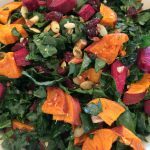 Click the link at the bottom for a slide show of some great lunch options that are nut free. Finding child-friendly recipes for lunch that are exciting, delicious and nutritious can be difficult. But what if you throw a nut allergy into the equation? It can make it so much harder since nuts have always been considered the go-to for something quick and easy. Don’t panic. You can put together the perfect menu for your child’s lunchbox. Their friends will be jealous, and you’ll have the mums and dads at school wondering what you do differently and asking you for your secrets. All you need is a few recipe ideas to get you started. Here are 10 delicious recipes that are nut allergy friendly to try today. Many of these you can make with the kids and encourage them to try something new. It’s Finally Available – Cook This Book! I have been working on a new book for quite some time. Not everyone was excited about it. By “everyone” I mean my publisher. Rather than toss aside my idea and manuscipt, I decided to self publish with CreateSpace. I had big help at home with illustrations. While looking for a graphic artist, I discovered my own kids were able to draw my ideas. (Thankfully they were less expensive too!). I also discovered going overseas to hire freelancers is a great way to find expertise, meet deadlines and stay within budget. Thank you to Dragan in Croatia! To be fair to my publisher, Cook This Book! is a big departure from my other Petit Appetit titles for sure. Rather than teaching parents, this book turns over the kitchen and foodie activities to kids. Many of my clients’ children, (as well as my own kids) love being involved in the kitchen and take food and cooking seriously. They are not alone, as we now have many kid contestant cooking television shows such as Chopped Jr. and Kids Baking Championship. There are even some pop up restaurants with kid chef’s under 18. Cook This Book! 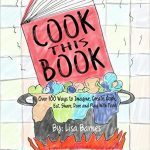 Over 100 Ways to Imagine, Create, Cook, Eat, Share Dare and Play With Food, encourage kids’ love of food and cooking by giving readers over one hundred activities, games, quizzes, and challenges that kids can do with food. There are no rules and no right answers. Each kid will experience the book in a unique and interactive way. Have a fast speed scavenger hunt in the supermarket. Create your own recipe using only five ingredients. Challenge your brother to a chili pepper taste off. Kids can skip around or do the same challenge over and over with different friends and family members and new ingredients. They can also post photos of their fun (#cookthisbook) to share and compare with other readers. 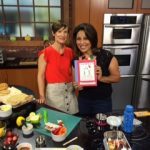 This book empowers kids to create, cook, eat, dare, and share their foodie fun, knowledge, and experiences. Those just starting in the kitchen will find recipes for some favorites such as spaghetti, pancakes, and brownies. With helpful tips for knife skills, restaurant etiquette, and more! By experimenting with food they just might become the next big chef, a food critic, or at least help you make dinner. 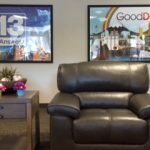 I had a great morning spending time with Julissa on Good Day Sacramento’s Mommy Moment segment. I brought a lot of items and ideas for healthy and quick toddler and preschooler snacks for on-the-go. 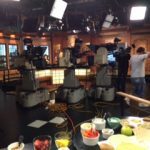 It was a fun 3 1/2 minute segment. The funny thing is all hours and energy for that 3 minutes. All totally worth it. Perhaps the best part is after spending a day shopping and prepping for the food and driving to and from Sacramento, my kids will have their own snacks and lunches ready for the next few days. I think we’ll even have a “Make Yourself Anything” night for dinner. So much in the refrigerator – everyone can create their own dinner with all the prepped veggies, meats, dips and spreads. There’s even breakfast for dinner possibilities with eggs and pancakes. Decisions, decisions….. Here are some photos from the shoot and the video.